to help Hatt cut up the rest of her carpet. Father & Mother went to the west farm. As we came home I stopped at Cochrans and looked at a stove. I worked all evening putting up curtains. Sunday April 16th 1893 I was busy all morning getting dinner. Josie went to church. As soon as we had dinner Will hitched to the Surry and took up for a ride. We went to the west farm and stopped at home on our way back. We went to church in the evening. Monday April 17th 1893 We washed this forenoon a d got the regular work done. As soon as we had dinner Fanny went over home and Josie went with her to help make soap. Will had been up town in the forenoon looking at cook stoves and as soon as we could after dinner We went up and brought it down and it was all in place to get supper in. 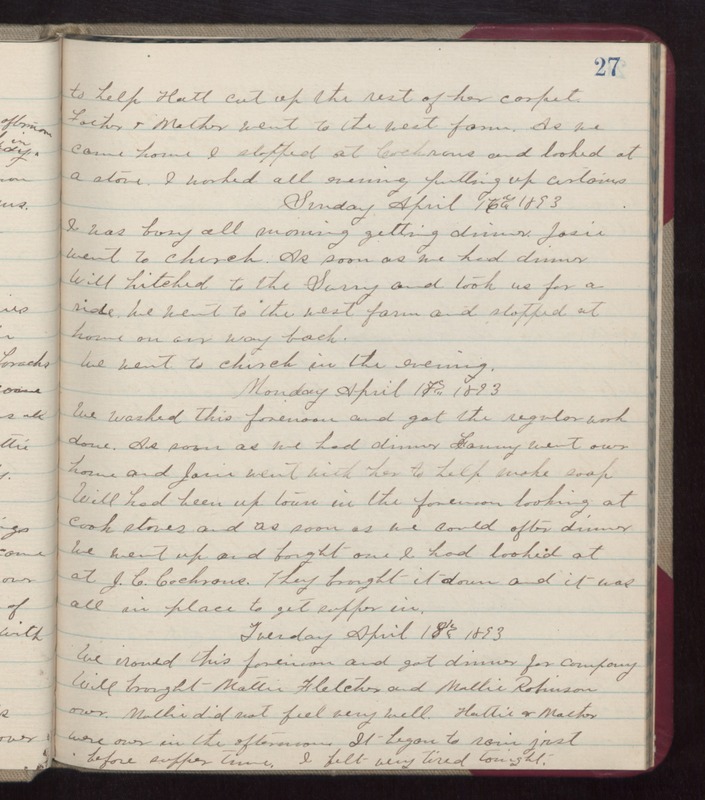 Tuesday April 18th 1893 We ironed this forenoon and got dinner for company. Will brought Mattie Fletcher and Mollie Robinson over. Mollie did not feel very well. Hattie & Mother were over in the afternoon. It began to rain just before supper time. I felt very tired tonight.